Do you want to save 1 cent on Martelli pasta? Go to the Food Emporium. Is the Food Emporium increasing the quality of their offerings? This would be great, as I have a local store near my house and it would be very convenient to shop there. 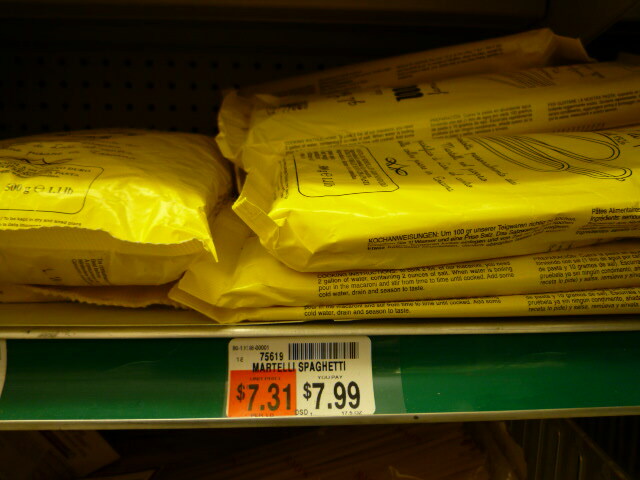 I went there yesterday and found pasta Martelli at $7.99; I was tempted to buy it there and save 1 cent but I didn’t. That we sell Martelli at the same price as Food Emporium is a further indication how hard we are trying to offer you value. How can we compete with the economy of scale of a 30 store chain in the metropolitan area, backed by their parent A&P? We try harder. Previous Post Zitto zitto… panettone has arrived. No flavors, no distractions, just plain panettone. Next Post This and That Lunch with Gustiamo – Don’t Call the Office Between 1 and 2pm, Pls.